Please note that the above sequence is the old "barcode" sequence added to all of the original CDSs in the early BioBrick part collections. I.e., it's not a random sequence. See http://parts.igem.org/cgi/htdocs/barcodes.cgi for more information (D. Endy). iGEM14_Carnegie_Mellon. 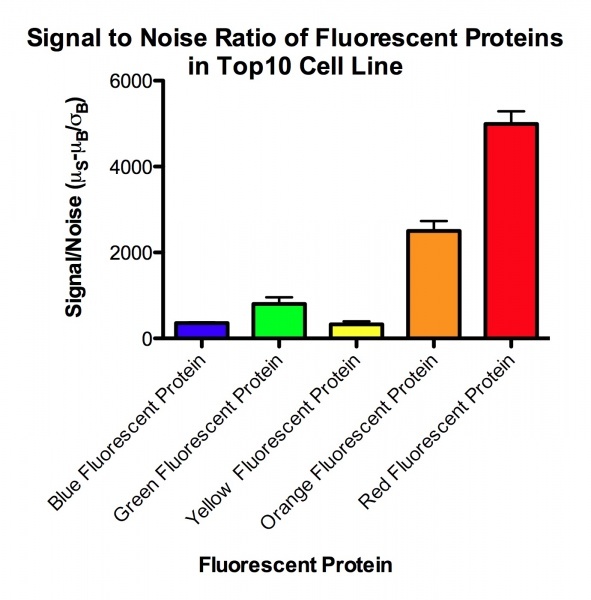 We characterized a set of fluorescent proteins consisting of BFP. GFP, YFP, OFP, and RFP. 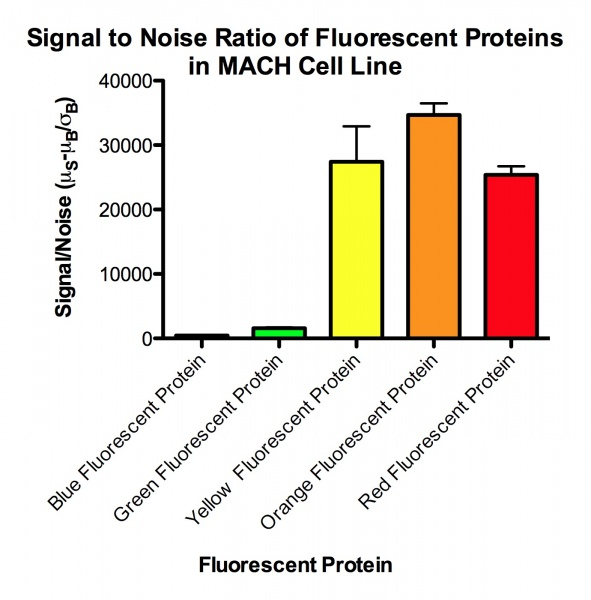 We calculated the signal-to-noise ratio of all the proteins in two different cell lines (MACH and Top10). 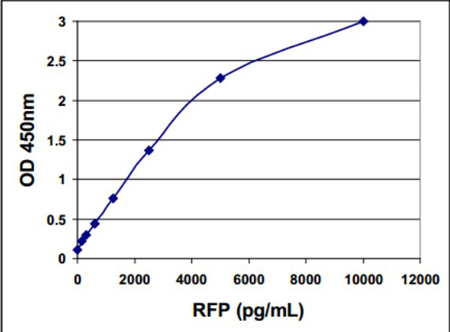 RFP had a high signal-to-noise ratio in both cell lines. 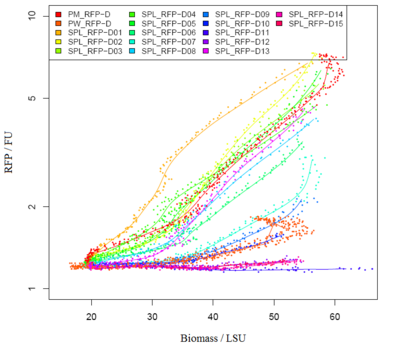 RFP was measured at (ex/em = 584nm/607nm). We have characterized RFP BBa_E1010 in several ways. 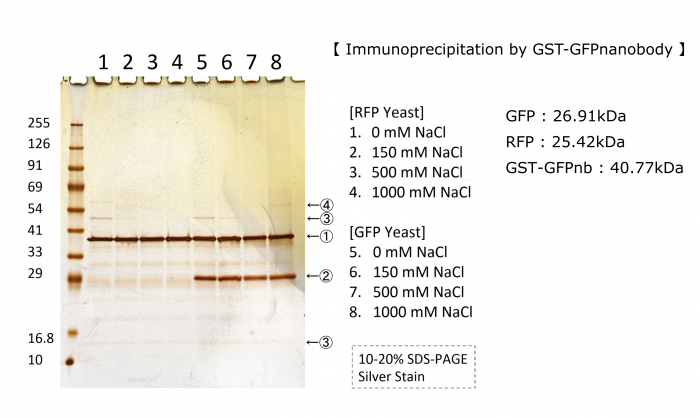 At first,we did immunoprecipitation by GFP nanobody in various salt concentration.Figure below shows RFP does not combine with GFPnanobody.Detail of this experiment is in this page Kyoto 2018 Secondly,TDH3 promoter and CYC1 terminator were added to both ends of ORF and cloned into pRS316 which is a shuttle vector of S. cerevisiae and E. coli. The resulting plasmid was transformed into wild-type yeast strain BY 4741 to overexpress mRFP in yeast. 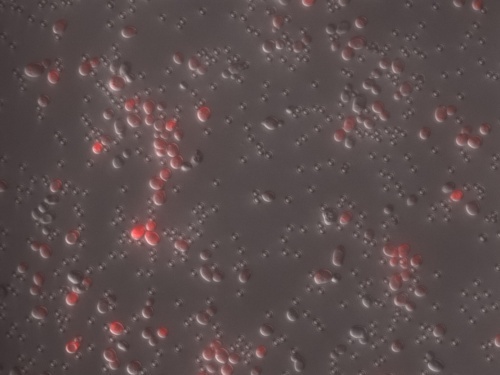 Photographs of pellets recovered from the culture medium of yeast cells is below.As can be easily seen, the yeast pellet overexpressing RFP was colored in a thin red color.From this, it was confirmed that RFP of BBa_E0010 can be expressed in large amounts in yeast cells without changing the codon and that the expression level thereof is so large as to be visually observed under visible light without breaking the yeast. Additionally, we captured RFP expressing cells that has FLAG tag on surface with magnetic beads coated with anti-Flag antibody. 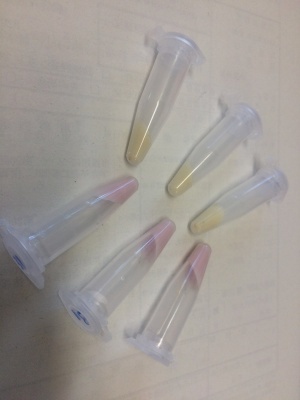 We can see strong fluorescence even in a single yeast. We grew C41 bacteria with parts BBa_J61002 in 2XYT for 24 hours. Purifying the mRFP by Ion Exchange Chromatography and Hydrophobic Interaction Chromatography, we measured the fluoresece (ex ,em ) of purified mRFP. 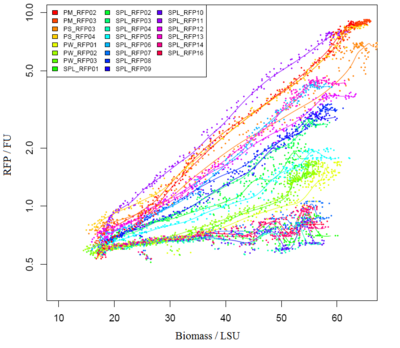 which is diluted to 10µg/100µl (total 200µl) in triplicates, into different buffers (ranges from pH2 to pH12). The result shows that the stability drops dramatically in pH condition below 6 and relatively stable in pH 6-10. 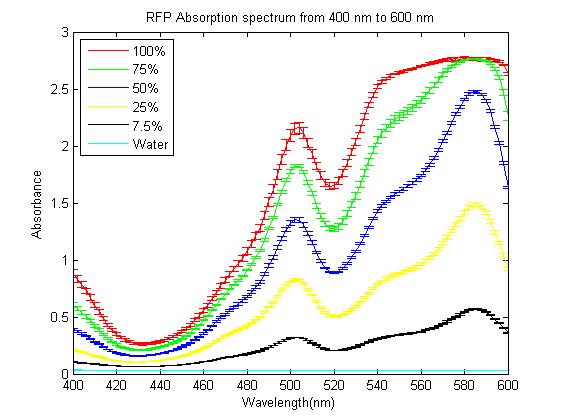 As part of the 2013 CU Boulder project we worked on separating RFP from AmilCP and during that process we ran into a problem that the fluorescence of RFP is too close to the absorption of AmilCP to tell them apart. What we ended up doing was measuring the spectrum of RFP from 400nm to 600nm. 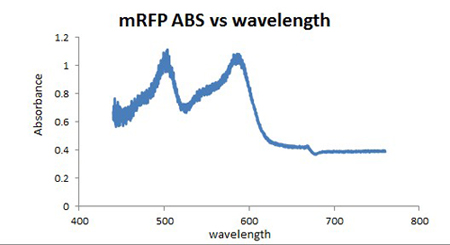 What we found is that RFP has a secondary absorbance peak at 502nm which is well clear of AmilCP. Under the devices we had access to this secondary peak also remained in the linear region of our device over a much wider concentration range. We also found that when running on an agarose gel RFP will run down on the gel while AmilCP runs up on the gel. We grew bacteria without device(BBa_J04450) and bacteria with parts BBa_J04450 in same volume until stationary phase. Taking bacteria without device as background, we measured the absorbance of bacteria with our device (the max absorption peak is 504nm).But absorbance in 504nm is higher than 1,which present a bad linear relation between absorbance and concentraton. 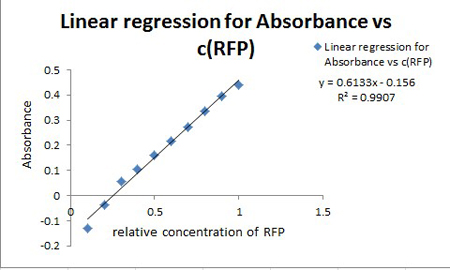 RFP has absorption in 450nm,and absorbance is between 0.1 and 1(better linear relation).Occasionally, we find a RFP standard curve under 450nm on the web.Before the mensuration, we diluted the two groups according to table1. We took the mean of two measures as the useful data. curve is reliable, our calculated result of RFP will be precise. 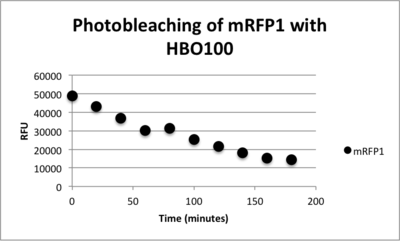 Photobleaching curve of mRFP1 with a HBO100 mercury-arc lamp"
XL10 Ultracompetent cells were transformed with BBa_E1010 cloned with BBa_B0034 as the RBS and BBa_R0010 as the wild-type lac promoter and induced overnight with IPTG.The overnight was bleached for 180 minutes with HBO100 (100W Mercury-arc lamp). Fluorescence data was taken using a Tecan Safire II with the parameters shown in Table 3. Fluorescence values are shown in Table 4. Table 4 Shows the fluorescence data over time during photobleaching. Figure 1. E.coli strain MG1655 expressing BBa_E1010 under control of BBa_K907005 after overnight culture. 3mL culture with M9 media in 14ml round bottom tube(left), and centrifuged cells in eppendorf tube(right). The expression of BBa_1010 is clearly observed with naked eye after overnight culture. We recommend you to measure the emission wavelenth at 619nm. Because the maximum excitaion and emission wavelenth are too close to each other, the signal overflows. You can get more precise results with our recommendations. We have characterized RFP BBa_E1010 in two different chassis to test the compatibility and the possible range of expressions before limitations in the cell metabolism. We have made constructs with a synthetic promoter library (SPL) in front of the E1010, by using BBa_I13507 and the plasmid backbone pSB3T5. For information on design of an SPL compatible with the BB standard see BBF RFC63. 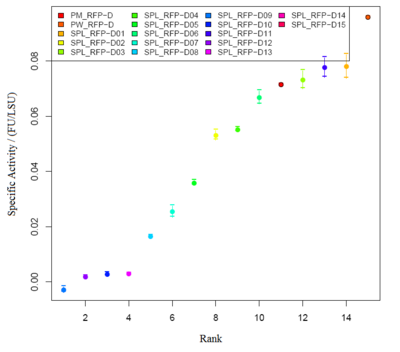 We have benchmarked the relative promoter strength range achieved from the SPL to the standard promoter BBa_J23101, by calculating the relative promoter strength in vivo as suggested in BBF RFC 19. For further explanation on methods see our iGEM_DTU_2010 wiki. In XL1blue with an RPU range form 0 to at least 1,13 RPU. In DHA5&alpha with an RPU range from 0 to 1,35 RPU. Graph2 XL1BLUE illustrates the variation in promoter strengths of the SPL mapped against the reference promoters. PM corresponds to BBa_J23101, PS corresponds to BBa_J23100 and PW corresponds to BBa_J23116. Graph3 XL1BLUEillustrates the specific activities of the SPL promoters ranked together with the reference promoters. 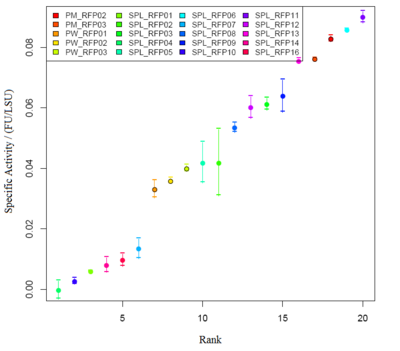 Graph4 DH5aillustrates the variation in promoter strengths of the SPL mapped against the reference promoters. PM corresponds to BBa_J23101, PS corresponds to BBa_J23100 and PW corresponds to BBa_J23116. Graph5 DH5a illustrates the specific activities of the SPL promoters ranked against the reference promoters. We successfully used this part for a read out system, e.g. in BBa_K389016. Additionally we compared it with a luciferase: BBa_K389004.